First Wave Of Artists Announced! The UK’s longest running and best small festival Truck has just announced its first wave of artists for 2018 to ring in its 21st birthday. The festival, which formed two decades ago in 1998, will this year take place from 19th – 22nd July at Hill Farm in Steventon, Oxfordshire. 2018 will be the first time ever that the festival has opened its doors on the Thursday with the festival taking place over four days this year. Festival Organiser Matt Harrap commented, “We're extremely excited to announce our first wave of artists for this year’s show! Having artists of the calibre of George Ezra and Friendly Fires coming to headline the event after many years of asking is truly humbling and their sets will no doubt live long in the memory. Returning heroes Peace will be the perfect way to kick off the festival with our first ever Thursday headliners. Personally I'm really thrilled to have the legend that is Gaz Coombes back at his favourite festival for the first time since 2013 as well as some brilliant up and coming local talent such as Low Island, Little Brother Eli and Kanadia. Mix in the likes of De La Soul, Jake Bugg and Everything Everything and the epic Switch takeover of Palm City then we've got a real party! The line-up also includes emerging artists such as hotly tipped The Sherlocks, Pale Waves, Marika Hackman, Nervus and The Amazons amongst others. 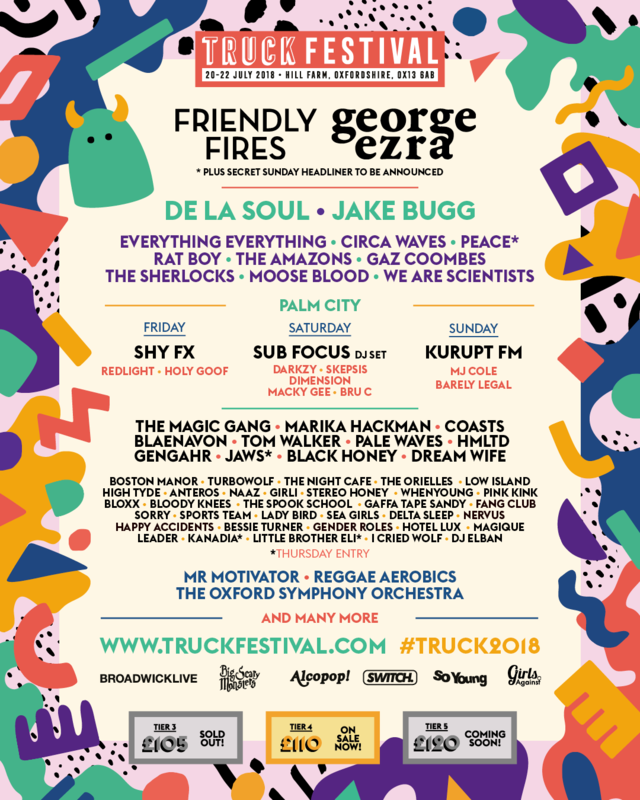 The line-up also offers plenty of artists performing a little further from home including New York hip-hop icons De La Soul and fellow Americans, indie rockers We Are Scientists who will be performing on the back of their much anticipated album ‘Megaplex’.